The 4th Annual Johnny Gaudreau Scholarship Golf Tournament will be held on Friday, July 26, 2019 at Ron Jaworski’s Running Deer Golf Club in Pittsgrove Twp., NJ. The tournament will provide families with financial need the opportunity to give their sons and daughters a Gloucester Catholic High School education! All proceeds directly fund scholarships and tuition assistance. A limited number of golfing spots are available on a first-come, first-served basis. Last year’s tournament sold out, so please register as soon as possible, if interested, online at www.johnnyhockeygolf.com. After all spots are filled, all subsequent registrations will be put on a waiting list. 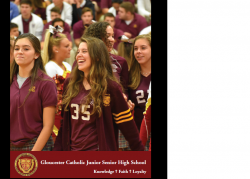 Your support of the Johnny Gaudreau Scholarship Golf Tournament will help to continue the Gloucester Catholic Advantage for another generation of Young Rams. A lot of great kids are counting on you! For additional information, contact Pat Murphy at pmurphy@gchsrams.org or (856) 456-4400, Ext. 219.